When discussing how type 2 diabetes works in the body it is important to know that type 2 diabetes is considered to be a chronic condition, meaning you have it for the rest of your life. This is important for a few main reasons which we’ll come back to in a minute. When you have type 2 diabetes, your body has a hard time using glucose (sugar) properly. So, the sugar in your bloodstream rises too high. Higher than it should normally be. The key takeaway for you is high blood sugar levels is toxic and can wreak havoc in your body. Gradually over time, high blood sugar levels cause problems with your organs. 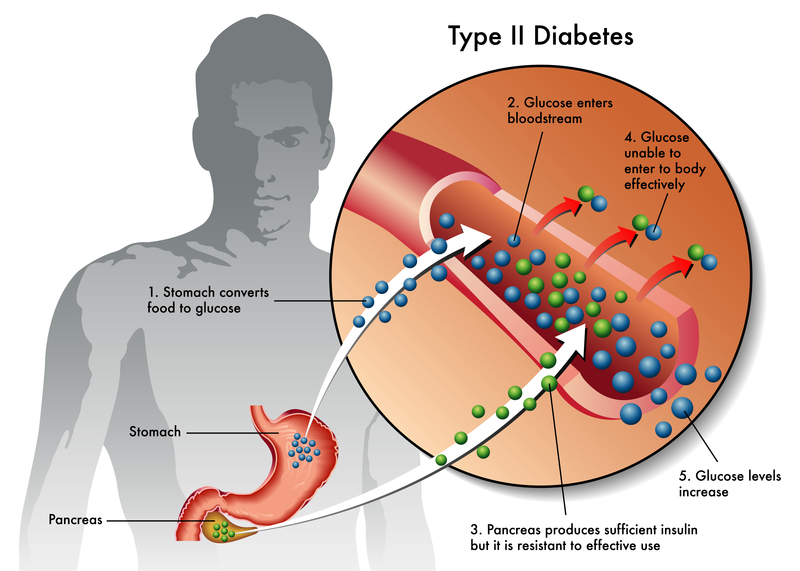 Type 2 diabetes is a chronic metabolic disorder that causes high blood sugar. The two biggest culprits are insulin resistance and metabolic syndrome. Insulin resistance is a defect in the way a person’s body responds to insulin. This defect can precede type 2 diabetes by up to 10 years and is one of the first dominos to fall before diabetes diagnosis. This is when your cells become resistance to the effects of insulin. When insulin resistance happens, glucose can’t get into your cells the way they should, and blood sugar levels rise. Your body uses the food that you eat as energy. One key nutrient that your body breaks down from the food you eat is glucose. Glucose or sugar gets into your bloodstream from the liver or intestines. Insulin enters your bloodstream from the pancreas and is released after you eat a meal when glucose is present in your bloodstream. Insulin allows your cells to take up the glucose by starting a chain of events that opens the door of the cell to allow glucose to go inside. Insulin is the key. When you have type 2 diabetes your body may not make enough insulin, the insulin response may be sluggish, or your cells could be resistant to insulin. This causes a problem because that glucose isn’t getting into your cells as it should. So, in turn, the glucose starts to build up in to dangerous levels in your bloodstream. Remember I mentioned earlier that high levels of sugar in your bloodstream is toxic? Type 2 diabetes can wreak havoc in your body. High blood sugar is toxic to your organs and can lead to serious complications if not controlled. Insulin resistance is usually the first domino to fall, which leads to type 2 diabetes. Metabolic syndrome, which refers to a cluster of problems caused by insulin resistance increase a person’s risk of cardiovascular disease and type 2 diabetes. The goal of any diabetes treatment plan is to reduce your risk to long-term complications by keeping your blood sugar levels in normal ranges. Prior to using this information, please consult with your doctor and diabetes healthcare team.